There is probably no topic more discussed onboard among novice cruisers and old salts alike than tipping: when to tip, how much to tip, whom to tip. Having sailed on more than 105 cruises over 45 years, let me weigh in on the discussion. First of all, it’s important to understand that, technically speaking, no tip is ever required. A tip is a voluntary expression of thanks. 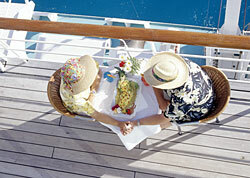 The gratuities distributed onboard the modern cruise ship, however, are not just tips. There are exceptions, but most cruise lines pay the men and women who serve their passengers an extremely low base wage (by Western standards). On nearly all big-ship mainstream lines, the service crewmembers are dependent on the generosity of travelers for the vast majority of their salary. Luxury cruise lines often have no-tipping policies. In these cases, the gratuities are built into the fares. Part of the difficulty with tipping is the English language. Where other tongues have two words for tip, English has only one. The French draw a distinction between service and pourboire. The first is the unavoidable cost of being waited on; the second is an expression of thanks for exemplary service. It is only somewhat recently that cruise lines began placing automatic service charges on shipboard accounts. They did this for two reasons. The first reason was the rising number of Europeans traveling on cruise ships. Europeans are accustomed to having a service charge added to their bills at first-class hotels. It is not in their culture to tip further. Likewise, it is not the custom in Japan to tip at all. As cruise lines attracted passengers from countries where tipping is not customary, they added service charges to guarantee their employees’ compensation. The second reason for the service charge was the proliferation of alternative dining venues. That a new ship will have multiple dining venues—beyond the buffet and main dining room—is now the norm rather than the exception. In the golden days of the ocean liner, passengers dined at the same table each day for three meals and tipped their assigned waiters, assistant waiters and head waiters. With programs like “Personal Choice Dining” and “Freestyle Cruising,” passengers are no longer tied to one team of waiters. Over the course of the week, they may encounter a number of servers in the process. Because it might be impractical for passengers to tip on each occasion—and cruise lines have touted the advantages of cashless cruising—the lines implemented service charges. If you ask at the Purser’s Office or Information Center whether the automatic service charge replaces traditional tipping, the answer you will receive is “yes.” But it is anyone’s guess just how much of the daily charge on your account will go to a particular steward or waiter. Tips are distributed on a schedule that includes those who previously went unrewarded like the servers in the Lido restaurant where most passengers eat their breakfast and lunch. To accomplish the admirable task of compensating the overlooked steward without causing undue complaint from passengers, the amount given to dining room and room stewards is less under this scheme than it was previously. I know this because I have asked stewards who have served under both systems. The top cabin and dining room stewards made out better before. Because tips are technically voluntary, many cruise lines allow passengers to opt out of the automatic service charge and to tip by themselves. The chief reasons for this, according to fellow cruisers, is that they consider them too high. These cruisers invariably tell me they will tip only the people who serve them and save money to boot. It is impossible to tip all the people in front of and behind the scenes whose efforts enhance passengers’ shipboard experiences. Dining room waiters often take turns in the Lido restaurant, serve tea in the lounge and attend the midnight buffet. Does anyone tip the steward who serves him/her tea in the afternoon? I never have, and I don’t know anyone else who has either. The exceptions are passengers who take their tea in lounges restricted to suite holders, who are served daily by the same steward. As cruise lines court an increasingly international passenger base, some operators are beginning to wonder if a one-size-fits-all service fee is the best option. In a groundbreaking move, P&O Cruises Australia announced recently that it would be ending its policy of automatically adding gratuities to passengers’ onboard accounts. Royal Caribbean also recently noted that it may reevaluate its policy in order to account for the culturally based tipping differences between its U.S. and European passengers. For now, however, service charges on mainstream mega-ships are here to stay, and they are a fair attempt to compensate employees and to allow for increased passengers mobility among bars and restaurants. Consider them a hidden cost of the cruise—like port charges and government fees. They allow the cruise lines to keep fares low by shifting part of their costs to passengers. When considering a cruise, add the cost of gratuities that will be charged to your shipboard account when you plan your budget. The guide that appears below, then, is not for tips as service—i.e. auto-gratuities, which should in all but the most remarkable cases be left untouched (or adjusted upward)—but for tips as pourboire. In all my years of cruising I can recall only once having received anything less than deft, professional service from shipboard service personnel, and I consider it a privilege to be able to thank them in a way they appreciate. It is customary to tip cabin stewards and butlers, dining room waiters, assistant waiters and head waiters on the last night of the cruise. Alas, I have been present when tablemates have not shown up that night to avoid giving tips. I have answered waiters’ anxious queries about the whereabouts of shipboard acquaintances and seen their chagrin. On some ships, envelopes for gratuities are left in cabins. On others, you can pick them up from a display at the Purser’s Office or Information Center. On others still, you must ask for them. While envelopes are certainly the way to go in giving most tips, it is much nicer to use your own. I always bring a supply of gift enclosure envelopes, available from stationers. These are smaller than the envelopes provided by cruise lines and can more easily be palmed to the recipient during a handshake. I always write thank you on the envelope, include my cabin or table number and sitting and sign my name. I want my waiters to know who tipped them and how much. I have seen advice to the effect that it is permissible to leave a cabin steward’s tip on the pillow when leaving for dinner the last night of a cruise. That is a custom whose time has passed. Today cabin stewards are assisted by helpers who do the heavy cleaning. These personnel are tipped in their turn by the stewards out of what they receive. It is not a good idea to tempt cleaners by leaving money in plain sight. It is better to hand an envelope to the steward, even if that means waiting for him or her. The cabin steward and butler, the dining room waiters, and assistant and head waiter are tipped on the last night of the cruise. But there are exceptions to this rule. If you plan to do a lot of entertaining in your cabin, or if there is an infant or someone who is ill in your party, you will require extra service from your cabin steward. It is a good idea to give him/her a portion of his/her tip at the beginning of the cruise. You will be surprised how obliging that will make him/her. On ships on which I am a regular passenger and am known by the crew, I tip bartenders on the last night of the voyage, using an envelope. On certain ships, I choose my bar by the bartender. If a bartender remembers me from previous sailings, knows my drink and asks for my family by name, I know he/she keeps a record book of regular passengers. The cruise line will have provided the names of returning passengers to the crew. A good crewmember will have gone over the list, compared it with his/her record book and be prepared for my arrival. These members of the crew are worth their weight in gold; I reward them accordingly. I once cruised on a ship on which I did not care to return to the table to which I had been assigned. I dined half the remaining nights in the alternative restaurant and the other half in the dining room. For four nights, the dining room maitre d’ obliged with a window table for two. Knowing I would be back with the same request, I tipped him each time he produced a table. He always feigned embarrassment, but he never failed to have a table waiting. Because I had different waiters each night, I tipped them each night in cash. Instead of a waiter thinking he/she had an additional table to serve and one that would not produce revenue, I had, as word spread, happy, cooperative waiters. For the following guidelines, I am going to assume that there is a service charge added to the daily account, usually between $10 and $12 per person, per day—and that passengers will pay it and not opt out. These, then, are pourboires for exemplary service. Looking at it another way, I always try to tip roughly 10 percent of the cost of my cabin, which includes the service charge—and so I typically budget at least $15 to 20 per person, per day, on top of the service charge. Cabin Stewards: I tip cabin stewards $5 a night, whether I occupy a cabin by myself or share it with another. It is the same amount I give to the maid in a good hotel. Room Service Stewards: I tip room service stewards $2 per visit. It is no easier to deliver for one than for two, so the tip would be the same for two people. Be prepared to tip in cash each time he/she comes. Some lines allow you to add a few dollars to the onboard bill; others won’t give that option. Bartenders: If I know the bartender from a previous cruise and drink regularly in his/her bar, I give him/her an envelope on the last night of the cruise. On some ships, bartenders give me complimentary drinks—they know they will be remembered later. When that happens, I double the tip. The bartender has given away the ship’s liquor, which costs him/her nothing, and I have saved money on my bar bill; we split the reward. I give my regular bartender $5 a day. If I go to different bars, I leave $1 per drink with the bill—on top of the automatic gratuity (usually 15 percent). When I am served hors d’oeuvres nightly by the same steward, I give him/her $5 on the last night of a one-week cruise. If I have been served by different stewards each night, I do not tip them. Wine Stewards: If the wine steward has done nothing more than produce and pour the wine I have ordered, I tip him $10 for a one-week cruise. If, however, he/she has recommended wines, kept bottles from meal to meal (and from dinner to lunch, a nice touch) or has decanted wines I have brought to the dining room, I tip $5 per bottle on top of the service charge. If the bottle is mine, I tip $10 per bottle, in addition to the corkage fee. Maitre d’s and Head Waiters: I usually do not tip the maitre d’. The only service he/she provides is assigning a table. If I like my assigned table, there is nothing he or she can do further. Unless it were an occasion like the one I described earlier, and I want a (very scarce) window table for two, I would assume it to be part of the maitre d’s job to move me to a more congenial table. Another reason for not tipping the maitre d’ is he/she is a ship’s officer and is paid accordingly. On the other hand, I tip head waiters $1 for each night I am in the dining room, even if he/she has done nothing more than greet me. The head waiter supervises the waiters and assistant waiters, and much of what he/she does is behind the scenes. If, however, the head waiter has promoted ordering off-menu items, prepared special dishes tableside or provided a cake for a special occasion, I would add an additional $5 per person, per service. Dining Room Waiters: I tip dining room waiters $5 for each night I am in the dining room. If I dine in an alternative restaurant, I tip the waiter $5 in cash on top of the service charge, which cruise lines tell us already includes gratuity. Dining room waiters usually work in teams of two. I allow the team in an alternative restaurant to divide my tip as they choose. In the main dining room, I divide my tip between waiters (equal amounts) or between waiter and assistant waiters (2/3, 1/3), and put each one’s name on an envelope. Shore Excursions: For a half-day bus excursion, I give the guide $2; or $4 for a full-day excursion. If the guide has spoken with me at length individually or confided to me places for dining or shopping after the tour, I tip him/her $5 for a half day and $10 for a whole day. And I don’t forget the driver. After all, he/she brought me safely down the Dolomites or negotiated the traffic in Athens. I give drivers $1 for half-day excursions, $2 for a full-day ones. Kids’ Club Counselors: Expect to tip in the neighborhood of $15 per child, per day to the kids’ club team, assuming that your children will be spending a large chunk of time participating. That works out to about $100 per child for a weeklong cruise. Baggage Handlers: If I am in my cabin when my bags are delivered, I give the handler $1 per bag, just as I would a bellman ashore. Likewise, if I am escorted to my cabin by a steward I’ll never see again, I give him/her $2. Spa Services: If the spa has added a 10 or 15 percent gratuity to my bill, I round it up (in cash) to between 18 percent and 20 percent, which is what I would normally tip at home. Butlers: For attentive service by butlers who have served as valets, brought trays of tea or hors d’oeuvres, and kept the liquor closet filled, I tip $5 a night at the end of the cruise. Ultimately, it’s important to understand that money is not a substitute for saying thank you; it is in addition to verbal thanks. One of the nicest ways passengers can say thank you is to mention stewards by name in the end-of-cruise questionnaire. I have had stewards thank me for compliments I gave on previous cruises when I saw them the next time. And, if you cruise often, there will be a next time. Greg Straub, the author of this article, is a regular Cruise Critic contributor and a particular expert in ocean crossings.